« What saves the soul? 4 Responses to Problems with the "Sinner’s Prayer"
Some believe that regeneration precedes faith while others do not. I suppose it boils down to whether one is a Calvinist, an Arminian, or something else entirely. I think God uses various means to bring others to Him and that there is not one right way, but many. Some are raised in a Christian family and have no recollection of ever saying a Sinner’s Prayer, but nonetheless they have faith in Christ. Others are baptized as infants and slowly as they grew they became quite aware of the presence of God and began calling out to Him regularly. Others were raised in non-Christian homes where they never heard anything about Christ, but later on called out to Him in faith, trusting that He would answer them. I’m sure there are many more scenarios I could give. The problem with many who are in the Sinner’s Prayer camp is that often they believe that is all that is required of them – a once-saved-always-saved mentality. 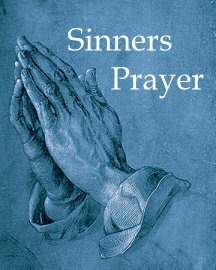 With that said, I prayed the Sinner’s Prayer and that was how Christ began to reveal Himself personally to me. However, I argued for several hours beforehand. Furthermore, I had been praying for three months prior, calling out to what I believed was the thin air, asking God if He existed to show Himself to me. Having been raised as an atheist/agnostic, I had no understanding about God whatsoever. The Lord used a book I had bought at a garage sale, “The Imitation of Christ” by Thomas Kempis. As I read that book, I wanted what he had. Oddly enough, some years later I discovered Kempis was a Catholic. Not surprising I suppose, since there were no Protestants at that time it was written. Thanks again for your thoughts. I used the Imitation of Christ as my daily devotional in my early days as a Christian, along with a New Testament & Psalms. There’s a lot of strong wisdom in Thomas a Kempis’ book. While I do believe that God can, and often does, work *in spite of* our means because He is sovereign and omnipotent, that should never be taken as a justification for using questionable means. We are still responsible to present the gospel clearly and responsibly to unbelievers based on what God has revealed rather than on a relatively recent, man-made method that has no support in Scripture. The use of the sinner’s prayer did not begin until very late in church history. The pitfall that the majority of Christians are falling into nowadays is to substitute personal experience for divine revelation, and perhaps nowhere is that more clearly seen than in evangelism. From what I have heard from various Christians, most people seem to determine what constitutes biblical evangelism by mere experience and personal opinion instead of what God says in Scripture. No wonder there are so many unbiblical methods of evangelism being used out there. Experience trumps Scripture for many people, and to me that is dangerous and perhaps even reflects a low view of revelation. I refuse to evaluate any evangelism based on how I was personally saved because my personal experience–though very meaningful and important to me–does not carry authority. Instead, I evaluate any given evangelistic method based on the divine authority of Scripture. Christianity is based on an objective text–the revelation of God–and not on subjective perceptions and feelings. This is very good, how do you suggest a situation where other evangelists want to labor with you in sharing the Gospel, but they use the sinners prayer to lead people to Christ? Thanks in advance. The sinner’s prayer makes sense only if that statement, “man can (unaided by grace) make the first move toward God” is true. In other words, the belief that man can make the first step toward God apart from grace is why people use the sinner’s prayer. If they believed the opposite–that man is totally unable to take that first step–then they wouldn’t use it because they would be waiting for God to initiate. It could be that such people are not even aware of the heretical source of their method. If you made them aware of that, though, they might take a second look at it and be willing to leave it behind.